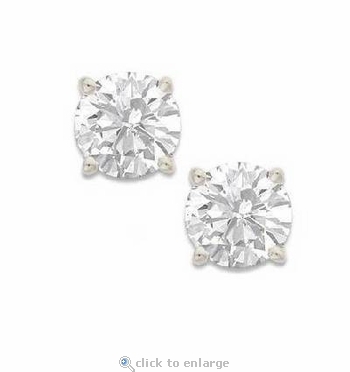 The Ziamond .50 Carat Each Round Cubic Zirconia Stud Earrings 14K White Gold Screwbacks feature our finest quality hand cut and hand polished cubic zirconia stones. These lab created laboratory grown lab created earrings feature a .50 carat each Ziamond cz measuring 5mm each for a total carat weight of 1 carat for the pair. Each round stud is set in a classic four prong basket setting with threaded screwbacks. 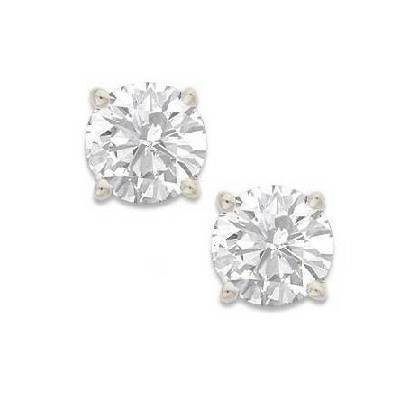 These Ziamond round studs are available in 14K White Gold. Please see the pull down menu for options. For further assistance, please call us directly at 866-942-6663 or visit us via live chat and speak with a knowledgeable representative.